Dave's Ravings: Star Wars Celebration 4 and New ART!! Star Wars Celebration 4 and New ART!! Sorry for the long wait between blogs. Been pretty busy with life, art and stuff. The big news most of you have been waiting for is here. I have done a BRAND NEW piece of Star Wars art. This piece is being done for the Star Wars Celebration 4 in LA on May 24-28. 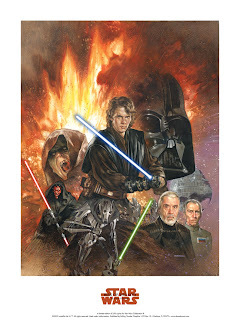 LucasFilm has granted a license to produce a print LIMITED to 250 copies to be sold only at the convention. These prints will be signed and numbered by me and when you purchase you may be able to get a small drawing (Remarque) on the piece at that time for free! I had the opportunity to do a similar print for the Celebration 3 (see art below) and it sold out before the end of the show. The piece was called "Rise of the Sith" and was VERY popular with the fans. The art I have done for this year's show is in a format similar to the trilogy I had done for the re-release of Episodes 4, 5 and 6 in 1997. The art is horizontal in the same format as the image of the film, i.e. widescreen format. The size of the print will be 20"x36", which matches the 20th anniversary prints, so those of you who want to match the previous prints: "Dewback Patrol", "Battle of Hoth", or "Jabba's Palace", this print matches those exactly in size. For those of you who are interested I am taking a HOLDING list prior to the show. This list will only be for those interested in purchasing the print AT THE SHOW and want me to hold one for them until they can pick it up. (I CAN NOT SELL the print prior to show or after the show, it will only be available from me directly at the show itself! I know that might seem unfair to those not able to attend, however those are the contractual rules I must follow). If you would like me to hold a print for you (I will limit the hold to 2 prints per person) please email me directly, dormanart@yahoo.com, and put CELEBRATION 4 PRINT in the header. I will also be attending the STAR WARS CELEBRATION EUROPE In July. More on that in an upcoming blog. See ya next time! 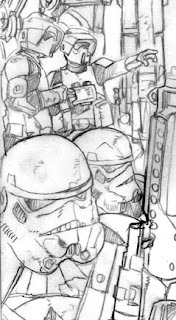 Hi Dave - Love your stuff since the days of Dark empire . Great to see you have a blog with sketches and paintings . Your artwork always has that big moment feel to it and has certainly drawn me into any book you have done the covers for . SWC4 Print HOLD List Closed!